When commissioning any large project a good working relationship is required. Its important to understand the company your working with; who they are and where they’ve come from. The Fit Out Pontoon Ltd. began it’s journey back in 2004 when Mark Speakman (the business owner) aged 24, fresh out of university, as an absolute amateur first started living-aboard. With an education focused around Design Management, Product Design & Furniture and just under a decades experience working for a company providing bespoke engineering solutions hopefully you’ll see how his experience and skill set has played a pivotal role in directing The Fit Out Pontoon to where it is today. After the sucessful completion of several canal boat fitouts working using local contract boat fitters and and ever growing build schedule The Fit Out Pontoon feel the time is right to employ a dedicated team of boat fitters. If you’ve looked around our website you know at heart we’re a canal boat design consultancy with an ever growing demand from our clients to manage the entire build and fitout process. As a design consultancy we are not phased by pushing boundaries, implementing new techniques, or by using new materials. To be able to offer truly bespoke unique high end canal boat fit outs we decided employ high end shop fitters used to working with the likes of Chanel, Yves Saint Laurent, high end restaurants and bars. The addition of Kris & Dom is very exciting and they can’t wait to get involved in our projects and start building high end, bespoke luxury narrowboats & widebeams. The Fit Out Pontoon are now all settled in at our new design studio which even if we do say so ourselves is looking superb! 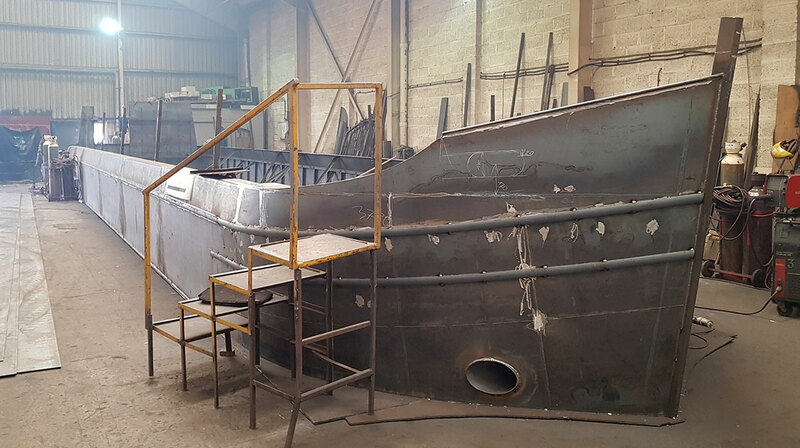 To top this off, conveniently we’ve also signed the lease on a neighbouring bespoke boat building workshop to accommodate our ever growing demand for custom designed and built canal boats. New Website, First Handover – New Chapter! After 6 months development we launch a new website reflecting our current business model. We handover our first canal boat build and following its success the decision is made to redesign and build a new widebeam to replace the one we designed in 2012. 2018 will see the build of our first show boat, one far from standard! As demand rises its time to employ an additional full-time designer. We start exploring designing, building and fittting dinettes and bespoke furniture with a team of dedicated fitters. As one of our canal boat designs proves to be too risky for main stream canal boat builders, The Fit Out Pontoon are commissioned with their first build project – A 57x12ft apartment style canal boat. As our experience grew so did our equipment and in 2016 The Fit Out Pontoon invested substantially into in-house printing equipment which would facilitate printing/producing all canal boat design plans @ 1:25 scale which lead us to opening up a service for people looking to design their own canal boats to scale. This online service would automate the ordering of a canal boat drawing set of any sized canal boat, narrow or wide beam. From these orders we produce, print and post 1:25 plans in parcel tubes. This service proved to be very popular from the start. As demand grew in 2015 The Fit Out Pontoon’s focus shifted to canal boat design and we set about streamlining the processes involved and playing with different methods of illustrating the details with a view to becoming the UK’s only independant canal boat design consultancy. After getting to know many the UK’s boat builders, interest was growing around the design skills displayed for the build of our 69x11ft widebeam, so much so we started to work with several builders in the background producing and illustrating canal boat layouts for production purposes. 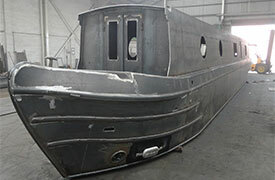 Boat brokerages also start commisioning boat layouts of brokerage boats for information purposes. After nearly two years of hard work and commitment The Fit Out Pontoon’s online canal boat building resource and directory goes live with nearly 200 pages of decision making information and a 2000 strong company directory. A great achievement for all involved. After six months woking on the complete design process The Fit Out Pontoon complete their first canal boat design project. This included 4x detailed drawings and 2x computer generated animations. Little did we know this would prove to be one of the most detailed canal boat design processes ever executed. 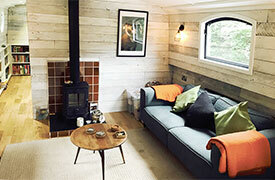 As circumstances change in life and financially so do the needs of living aboard. A widebeam suitable for family living is now required. After visiting The Crick Boat Show 2012 an order is placed for a fully fitted 69x11ft widebeam built to The Fit Out Pontoon’s design. 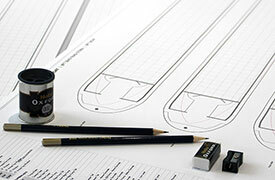 Time to couple professional design skills with practical live-aboard knowledge and requirements. The Fit Out Pontoon website preparations begins… Researching and copywriting over 180 pages, creating an up-to-date list of nearly 2000 suppliers and adding them to a custom design database driven website! Being completely honest we were unprepared for just how much work was involved but we’d started now so there was no going back! After several years working within marketing for a company which designed & manufactured bespoke engineering soloutions I realised that there was a growing trend for online directories. I saw a gap in the market for niche directories which offered its visitors decision making information which would then create a need for the suppliers on the directory. The obvious subject matter was canal boats, with the steep learning curve I’d experienced there was a huge amount of information which could have saved me time and money in hindsight. With this in mind I realised a resource focused around fitting out canal boat with an up to date directory of suppliers could have real potential. Aged 28, armed with a credit score and a secure job saw the purchase of my second boat, a 2004 45ft traditional narrowboat. The intention being not to do any work to her and just enjoy her, this lasted about 8 months before I started updating the entire boat! Being just 4 years old this boat with its modern engine and current on-board equipment and central heating proved that living aboard could be much more like a home from home. Aged 24, fresh out of uni, extremely low on funds but high on enthusiasm I purchased a 1976 30ft Narrowboat, with a wooden top and canvas roof, propelled by a 1970 single cylinder inboard engine. This boat was responsible for a steep learning curve and for the 4 years I owned her I never stopped working on her… Leaks and all, I thoroughly enjoyed the entire experience.